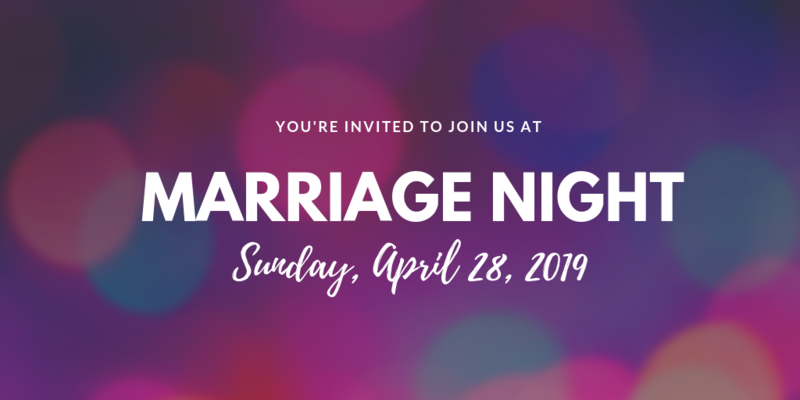 Join us April 28, 2019 for our annual Marriage Night! This evening will allow you and your spouse to enjoy an evening date that will include lots of laughter around dinner, dessert for two, giveaways, and a message of encouragement, along with a free gift for every couple. $55 per couple, $35 per individual (must be married or engaged). Cost includes registration, dinner and dessert for two and giveaways. Childcare is not provided. Can just one of us attend? Yes, if your spouse is unable to attend, you are welcome to attend for $35. Is childcare available? No childcare is available at this event. What does registration fee cover? The covers dinner, dessert, giveaways and an evening gift. If we are not married, are we allowed to attend? This event is a perfect venue and topic for anyone in a serious relationship moving toward engagement, currently engaged or married. How long is this event? 2 hours – it will go from 7 pm-9 pm. For more info, call us at: 763-389-4340 or email us at [email protected].